The Canberra Calligraphy Society was founded in 1986, when three friends gathered and called for people interested in calligraphy to come together. The Society was formed and since then has gone from strength to strength, maintaining a membership of roughly 60 calligraphy enthusiasts. In 2016 the Society celebrated its 30th anniversary and is looking forward to another exciting 30 years of calligraphy in Canberra. As ideas and techniques change the penmanship also evolves. Tutors for workshops are sourced from amongst our members, interstate and international calligraphers. Workshops are held once a month at the Urambi Village Community Hall in Crozier Circuit, Driveway B, Kambah, usually from 1 pm–4.30 pm on the 4th Sunday of every month, except December and January. Once or twice a year the Society organises weekend workshops with visiting tutors. This month it is thanks to Jill Robertson for this member's profile. When did you become interested in calligraphy? I first held a calligraphy pen when I was 11 or 12 at a school in England. I was fascinated by the way holding the pen at a constant angle made all those wonderful shapes! Then it was not until I was in my late 30s that I was able to take up calligraphy as I wanted a hobby that had nothing to do with relating to people! At the time I was a marriage counsellor and that could get pretty intense! Who are the calligraphers who influenced your calligraphy? Has that changed? Who are they now? I think the people who influence my calligraphy are usually the leader of the latest workshop I have attended! Thankfully we have had some wonderful teachers in Australia over the years. In my first year of learning calligraphy – 1984 – we had a visit from Donald Jackson, and although I didn’t go to a workshop with him, I went to his public lecture at the Mitchell Library in Sydney and was hooked! My first tutor was Helen Warren and she helped me to see I could do calligraphy! From my own experience of overseas tutors I think of Denis Brown and Anne Hechle, but also our Australian tutors – especially Gemma Black, Elaine Witton, Olive Bull and Deirdre Hassed. I also love the work of Timothy Botts. He is not someone I have met, but I love the fact that he doesn't rely on artistic illustrations to show the meaning in his words - it is all in the way he writes them. Are there any other artists who have influenced your calligraphy? I just love the Celtic artwork from ancient times and am fascinated by the intricacies of their designs. What are the best/stand out calligraphy courses you have attended and why? In the late 1980s I went to a 4 day course with Charles Pearce. That was the first intensive course I had attended and he covered several scripts. It was great to attend when I was new at calligraphy. What are your favourite tools and why? I love my Brause nibs and my Pilot Parallel Pens, because they are quite hard and I have a heavy hand and they don’t collapse under pressure! As a contrast I also love the copperplate nib Brause EF66, which is quite tricky to control but makes wonderful contrasting thick and thin strokes. I also like using balsa wood as a contrast to pen work. What are your favourite scripts and why? My favourite script is definitely italic. I find it just happens when I pick up a calligraphy pen and start to write! It is a great script for formal work and for casual work, for large letters or small letters. I also like uncial, as that is a great connection with Celtic work. It is easy to pick up and can be written on straight or curvy lines or in spirals and circles and always looks neat. What is the most challenging script or course you have attended? Do you have examples of this? I found the workshop with Massimo Palello in 2013 to be challenging but immensely rewarding. Getting the hang of his free-flowing extended lines took a bit of getting used to, but the ah – ha moment that followed was worth it all. Nothing special at the moment – wondering what to do at our Jindabyne retreat! Have you observed major changes in the calligraphy world from when you first started calligraphy? Calligraphy has now become much more of an art-form, rather than a way of producing “beautiful writing”. I marvel at the pieces I see in magazines and realise I am still just a competent “beginner”! We are encouraging members of the society to share with us their calligraphic journey. Our first volunteer is Angela Hillier. Thank you Angela. At Portsmouth College of Art as a full time student, studying Design, Publicity and Display, UK. Tom Gourdie, Edward Johnston. Donald Jackson, (St John’s Bible), Derek Tickle, initially. Now Brody Neuenschwander, Amity Parks, Jan Pickett, Massimo Pollelo. Yes, it has changed with much more freedom for self expression and use of mediums. Ruling and Horizon pens for the freedom and flexibility they give. Don’t have one - maybe the one I am working on now! Preparation for 24 students working at many different levels from ‘raw’ beginners to advanced, Lake Ginninderra College, term 3. Yes, there is much more room for freedom of expression and almost any medium can be used; anything from milti-layered collage to house paint. Angela is a founding member of the Canberra Calligraphy Society (CCS) and a Life Member. at the Central Electricity Generating Board and on the display team at a large department store. 22 at Lake Ginninderra College. 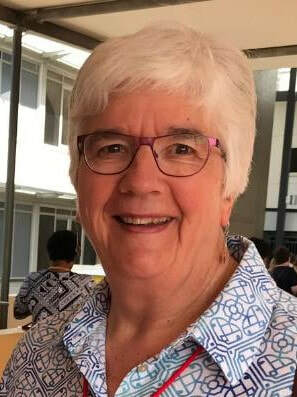 She is scribe to the ACT Chief Minister, the Governor-General, House of Representatives and Senate and various Prime Ministers.